Revesby 157-9, Ancaster 100 - Revesby won by 57 runs. Revesby CC recorded a 57-run success at home to Ancaster on Sunday. The hosts posted 157-9 from their 40 overs in this Lincoln and District League Premier Division contest. In response, Ancaster were dismissed for 100, earning Revesby 20 points. They currently sit fourth in the table and travel to Sleaford on Sunday (1.30pm). 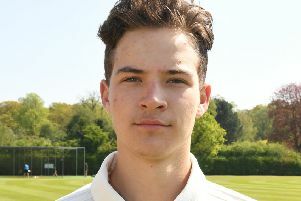 Revesby recorded a 21-run success at home against Freiston, Leake and Leverton in a friendly last Thursday. The home side posted 125-2, with Freiston ending their innings on 104-5. Rob Jeffery (59), Carl Wall (22), Jamie Lewis (16 not out) and Paul File (15 not out) the pick of the batsmen. Lewis, Aahad Khalid, Darren Hunt and Michael Ridding took a wicket each.